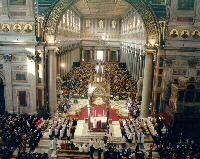 Pope John Paul II presides at the Jubilee Mass for Persons with Disabilities at St. Paul's Outside the Walls on 3 December 2000. The three above pictures record Pope John Paul II's greeting to parishioner Grace Bowen in the Pope Paul VI Audience Hall. Father McLaughlin, Barbara Golaszewski, Archbishop Foley and Peg Walsh, after dinner Sunday evening. 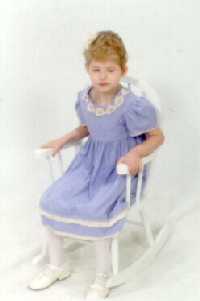 Grace Bowen, the 6-year-old daughter of parishioners Gerry and Doreen Bowen and a student of St. Edmond's Home for severely handicapped children in Rosemont, PA, was chosen as one of the 20 individuals from St. Edmond's to attend the Jubilee Day for Persons with Disabilities on Sunday, 3 December 2000, in Rome, Italy. The pilgrims from St. Edmond's represented not only individuals with special needs, but also those who care for them in a variety of different ways. In addition to Grace, it included 4 other physically and mentally handicapped children who live at the facility and get around by use of wheelchairs; one handicapped staff person employed at the Home for over 30 years, who also gets around by use of a wheelchair; two adults with special needs; and staff members and administrators from the Home, the Family Living Program and the Community Outreach Program. Grace was also accompanied by her mom and dad, Gerry and Doreen, her sister, Shannon, her grandmother, Margaret Obal, and her godparents: her aunt, Chris Bowen, and her uncle John Obal. Our parish celebrated Grace's selection to be present in Rome for the Jubilee Day for Persons with Disabilities as an honor to the parish family as well as to the Bowen family. Her special part n the December 3rd Jubilee celebration was first announced in our Parish Newsletter on October 8, 2000, along with a meditation on this particular Jubilee Day from the Vatican preparation committee. A further reflection was presented in the November 26th Parish Newsletter. Grace and her family attended our 10 A.M. Thanksgiving Day Mass, after the November 26th Parish Newsletter had gone to press. Father McLaughlin celebrated Grace's presence at the Mass and gave his blessing to the Bowen family in preparation for their pilgrimage to Rome the following week. As the Bowens were leaving the reception after Mass, Father Gabin told them that the pastor might very well join them in Rome. Gerry Bowen, Grace's father, immediately returned to Father McLaughlin to tell him how wonderful it would be if he could join the family in Rome. At his family's Thanksgiving dinner, Father McLaughlin asked his sister Loretta, the C.O.O. of the Magee Rehabilitation Hospital and an advocate for persons with disabilities, what she was doing the following weekend, and they both decided to go to Rome. On Friday evening, Father McLaughlin asked Jack Golaszewski, whose son Matthew has been severely disabled for twenty-eight years, what he was doing the following weekend; he was busy, but felt that his wife Barbara could go. On Saturday of Thanksgiving Day weekend, Carol Menscher of Boscov's Travelcenter found a flight and lodging for three. During the following week, Father's sister came down with bronchitis and had to cancel; parishioner Peg Walsh took her place  for many years Peg and her family have helped in caring for Matthew Golaszewski. On Friday, December 1, Barbara Golaszewski, Peg Walsh and the pastor left for Rome to join the Bowen family at the Jubilee Day. Upon their arrival at the Fiumicino airport, they were met by Father Xavier Paul, a friend from the Diocese of Tezpur, India, who was studying in Rome. Together they went to their hotel, near the Basilica of St. Mary Major. After checking-in, they went by bus to the Vatican where they visited the convent of the Missionaries of Charity (Mother Teresa's order), and then picked up tickets to Sunday's Jubilee Mass, courtesy of Archbishop John Foley, a former editor of the Catholic Standard & Times, and now President of the Vatican's Pontifical Council for Social Communications. Father Xavier Paul had secured permission for Father McLaughlin to distribute Holy Communion at the Mass. Following lunch, they visited the Bowen family at the Casa San Giuseppe in the Trastevere area of Rome. The Bowens led them on a walk through some of the streets of Rome on the other side of the Tiber. At the Piazza Navona the three new-arrivals returned to their hotel to get some sleep. Sunday morning they arrived at St. Paul's outside the Walls before 8:30 A.M. The pastor reported to the cloister to vest and receive instructions for his participation in the Mass; Barbara and Peg were able to get one of the last seats in the basilica. For the 10 A.M. Mass celebrated by Pope John Paul II, Father McLaughlin was seated directly behind the main altar; Doreen and Grace were in the sanctuary near the main altar; and the rest of the Bowen family were in the congregation, close to the altar. Disabled persons participated in the Mass as musicians, readers and gift-bearers. The Mass was in Italian, but the first reading was in Spanish, the second reading in English, and petitions in French, Portuguese, Polish and Swahili. The Lord's Prayer and Lamb of God were in Latin. The Mass ended around noon when the Pope led the congregation in the Angelus. Following the Mass, Barbara, Peg and the pastor visited the Basilica of St. Mary Major, ate lunch, and made our way to St. Peter's Square. Father Xavier Paul had secured two tickets to the Papal audience, so Barbara and Peg were able to attend. For the audience, Gerry was up front with Grace and Doreen was seated much further back with Shannon. As the Pope was coming down the aisle, at the suggestion of others from St. Edmond's Home, Shannon was passed from one person to another until she was at the aisle seat. 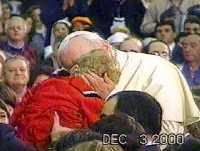 When he reached her, the Pope stopped to touch her and kiss her. Unable to see that because of the crowd, at the urging of those from St. Edmond's around him, Gerry picked Grace up from her wheelchair and carried her toward the aisle where a guard stopped him. However, as the Pope neared, another guard took Grace from Gerry to the Pope, who picked her up, caressed her and kissed her. That picture is indelibly etched in the minds of the Bowen family and the St. Edmond's Home community. 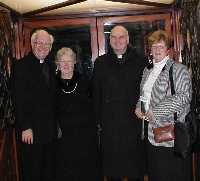 Father Xavier Paul, Barbara, Peg and Father McLaughlin then met Archbishop Foley and enjoyed dinner with him. He preached at the pastor's brother's first Mass, and at his Silver Jubilee, and has become a friend to their entire family. Monday morning, at 7 A.M., the three pilgrims walked through the Holy Door of St. Peter's. Then Father Xavier Paul and Father McLaughlin concelebrated Mass in a chapel in the crypt of the basilica, near the tomb of St. Peter  Father McLaughlin, Barbara and Peg continue to be deeply indebted to Father Xavier Paul for arranging that Mass, and for concelebrating. After spending some time in St. Peter's, they visited the Vatican Museum, the Sistine Chapel, the Basilica of St. John Lateran, and the Coliseum. Outside the Vatican Museum and again at the Coliseum, they met parishioners Craig, Linda and Cory Shea who were in Rome on a business trip. For dinner on Monday, Barbara, Peg and Father McLaughlin joined Gerry Bowen, Chris Bowen and John Obal for dinner at a Trastevere restaurant. They began making their way home Tuesday morning, following Mass at the Basilica of St. Mary Major. Many thanks all who prayed for the success of this weekend in Rome  your prayers were answered. Disabilities cross all cultural, ethnic and racial lines. Yet many Catholics of all ages who live with assorted disabilities and impairments are missing in our lives and in our celebration of Sunday Mass. We are called to love the whole human race, but cannot fulfill that responsibility when many are missing from our midst, including those who move through the world in ways different from our own; those who need to understand the Good News by means we fail to consider; or those who proclaim their love of Jesus Christ by means we are too impatient to understand. As we recall the Jubilee Day for Persons with Disabilities, let us resolve to seek out those with disabilities, and to welcome them into our lives and into our parish. The Holy Father distributes Communion at the Jubilee Mass for Persons with Disabilities. 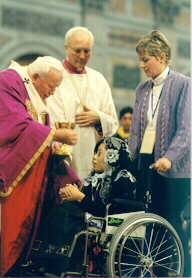 The Vatican Committee which prepared for this Jubilee Day issued several papers "in view of the full integration and inclusion of people with disabilities in the life of the Church and society, to valorize the gifts they bring, to reconcile ourselves with them for failings in their regard in the spirit of the Great Jubilee and to encourage an attitude of caring, assistance and solidarity." The Preparation Committee noted that we often turn our eyes from a person with disabilities, not always out of indifference, but because deep inside  perhaps subconsciously  they make us aware of how fragile and finite we are, feelings which we often try to suppress by our faith in "progress, science and technology." We have two choices: either solidarity, or rejection and negation. But solidarity is not just kindness, a good feeling: rather, it is both full and objective recognition of the person's right to full "citizenship," and above all a personal and conscious choice of our responsibility to enable that citizenship. We cannot limit ourselves to assisting persons with disabilities. we must instead take care of them. "The news that our grandchild had been born with serious problems and was fighting for life, hit us like a hammer. Our first reaction was a mixture of shock, disbelief, of uncontrolled hope that things would work out, and of grief. In the weeks that followed we experienced denial, anger, growing painful awareness and, finally, acceptance. "Laura had viral CMV and quadriplegia. We were able to accept Laura for what she was, and not for what she should have been. We became totally involved with Laura, spending time with her, helping my daughter Kathy to care for her, or looking after the other two children when she had to be away from the family with Laura. "We gave emotional support and love with acceptance and confidence. Our involvement helped Laura to accept her situation, and it helped her parents feel less isolated and overcome with grief and self-commiseration. When I take Laura out in the car, I have a wonderful chance to tell her stories, speak to her and listen, with no interruptions. These weekly journeys have built a deep, happy bond with her and given me a role in her development and education. I have come to realize that Laura understands far more that it would seem. "As a grandfather of a child with disabilities I have received much more than I have given. I have a special closeness with Laura's family. I have built closer relationships with my other children and their families because we all share the experience of Laura's family. I have acquired a new sensitivity for the needs and demands of other children with disabilities and their families. I have developed new appreciation for the talents of professionals and specialists, and a greater ability to help and console parents and grandparents who experience the arrival of a child with disabilities in their family. Above all I have acquired a very special friendship with a very special person, and experienced the joy and the closeness that a child with special needs brings to a family." The Lord Jesus offered himself as a victim to human violence, the fruit of sin and abuse of freedom, that his Church might be resplendent (Eph 5, 25-27). The reality of sin is always present in the Church, the Body of Christ; this is why sometimes her members make choices which fail to reflect the will of their "Head." Urged on by the vital impulse of the Spirit, the Church has the courage to examine herself and recognize her failure to promote the life of persons with disabilities. This Jubilee Day is a time for the Church to do penance and reconcile with persons who have disabilities; but it is also a time in which persons with disabilities offer forgiveness toward the Church. Liturgies should reflect both aspects. It is an opportunity for all to be reconciled with persons with disabilities and with their families. This day is the beginning of acceptance and inclusion of persons with disabilities in every day life as persons with a special gift, not only for the fact that they are persons, but also because of the particular vocation to which they are called by God. With this act the Church becomes truly the house of the Father where each and every one finds fullness of love divine and human. It is a day to overcome with concrete and significant gestures, through powerful witness, disability as separation, distance, diversity  and to see persons with disabilities as persons filled with riches and humanity. The celebration intends to rediscover guidelines and directives of the documents of the Church's teaching, which in many local Churches are not known, rarely studied, rarely assimilated, rarely put into practice. Therefore, it is an opportunity to put into practice these indications without hesitation, according to local situations and cultures for the full valorisation and inclusion of persons with disabilities at all levels of ecclesial and civil life. Local Churches, which for some time now have worked with success in this sector, have an opportunity to make a gift of their experience and reflections to other Churches that have still before them a lengthy task for the full integration of persons with disabilities in the life of the Church and society  and they are stimulated by the Jubilee Day to continue along the path on which they have already embarked. During this Jubilee Day, attention will be given to the celebration of the Sacraments, and the proclamation of the Gospel both to persons with disabilities and to their families, some of whom may have never heard the proclamation of Jesus, or heard it in a distorted manner. The day is an opportunity for study, reflection, and initiatives on the part of local Churches and parishes to focus attention on the person with disabilities; it is because of this Jubilee Day that the Churches and communities are able to embrace everyone: "the quality of a society is measured by the respect it shows towards the weakest of its members" (John Paul II, March 31, 1984). This day intends to stimulate a mentality, which will penetrate "centers" of religious, civil, social political and economic formation to eliminate the "culture of death" and proclaim the "culture of life". In this regard, involvement and witness of life lived and committed by persons with disabilities and their families are privileged ways for the transformation and growth of society. It is an opportunity for self-education in the parish community: it will help see persons with disabilities with serenity and trust and overcome fear and diffidence. Therefore, the stimulation which the parish receives, makes it grow so it will become a welcoming community free of ideological, mental or psychological barriers; beyond demolishing architectural and communication barriers, it sees these persons as a special gift from God, with Christ's triple ministry: priestly, royal and prophetic. The Vatican's preparation papers, the Pope's homily, his Angelus address, and audience message are all available here. The disability voice of the U.S. Catholic Bishops, established to further implementation of the 1978 Pastoral Statement of U.S. Catholic Bishops on People with Disabilities. Supporting the inclusion of persons with Mental Retardation in the Catholic Church.